Routledge-Cavendish Q&As – your path to exam success! Has the thought of facing your law exams left you feeling completely overwhelmed? Are you staring at the mountain of revision in front of you and wondering where to start? 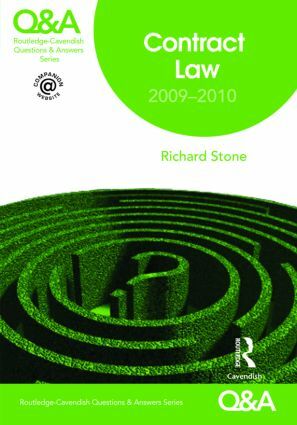 Routledge-Cavendish Q&As will help guide you through the revision maze, providing essential exam practice and helping you polish your essay-writing technique. Each Routledge-Cavendish Q&A contains 50 essay and problem-based questions on topics commonly found on exam papers, complete with answer plans and fully worked model answers. The titles are written by lecturers who are also examiners, so you can recognise exactly what examiners are looking for in an answer. The books in this series are supported by a companion web offering you bonus q&as; advice on preparing for your exams; revision checklists; discussion forums and more. "The book was an answer to my prayers… I’ve been begging tutors to give us ready-made answers so we get a structure as to what we should be including and revising and the Q&As do exactly that!" "The Routledge-Cavendish Q&As are very well designed and helpful, giving a good indication of what comes up in exams."